The issue begins by telling the origins of Complete Carnage and Radical, two super powered beings who got their abilities when they were each struck by the same bolt of lightning. The villain, Complete Carnage, was a construction worker, who became a rock-like monster after the incident. His rival, the heroic Radical, had been jogging through Central Park when she met her destiny and became enfused wth liquid energy. The two soon became enemies. Radical bested her opponent by tossing him miles into the air towards the North Pole. Complete Carnage didn’t reach his destinantion, however – instead, he bounced off a passing 747 and landed on the grounds of a religious cult in upper New York state. The cultists took in Carnage and treated him as their prophet, while training him in martial arts. Soon enough, Complete Carnage mastered the ability to pass through steel and concrete, and also absorb energy from the materials. With his newfound powers, CC set out to get revenge upon Radical. April and the Turtles are riding along in the van when a bike messenger cuts in front of them – April slams the breaks just in time! The bicyclist continues on, but suddenly a hand emerges from the pavement and grabs the front tire, sending the rider head first over the handle bars – but the woman lands on her feet with acrobatic flair. Complete Carnage then appears and attacks the bicyclist, who sheds her street clothes to reveal the costume beneath – it’s Radical! A fight breaks out amongst the super heroes and the TMNT decide that they’ll have to help the woman – so April pilots the van and smashes it into Complete Carnage! The crash sends Carnage through a wall, but he quickly reemerges and knocks Radical unconscious and then flies off with her. April and the TMNT give chase in the van. Later, Complete Carnage has imprisoned Radical in a cement mixer inside an old factory. 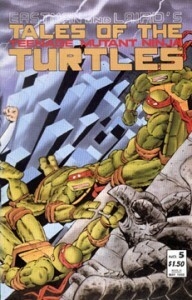 The villain plans to seal Radical inside a concrete block and then absorb her powers through it, but before he can begin the process, the Turtles arrive and save the super heroine. A battle ensues, and Carnage uses his ability to pass through walls to good effect, dishing out punishment without receiving any. Eventually CC grabs Radical from behind, but the woman catches the villain’s arm and rips it off! Radical then flies to a park (so Carnage can’t reabsorb his arm through the concrete floor) and hides it in some bushes. CC is hot on her heels and lands behind her, demanding his appendage back. The TMNT arrive and the fight is renewed. Finally, Radical uses her “particle beam power” and charges Complete Carnage – a huge explosion rips the air, and both super-powered beings are apparently obliterated – only small cement chips remain. The TMNT gather the remaining shards of Complete Carnage and mail them all over the country to try to prevent the monster from regenerating. In the final panels, we see Carnage’s arm come to life. It crawls to the highway, where it attempts to hitchhike across the country, in hopes of rejoining its body.